If you’ve rented a car during your stay in Iceland, then visiting Grótta will be a piece of cake. 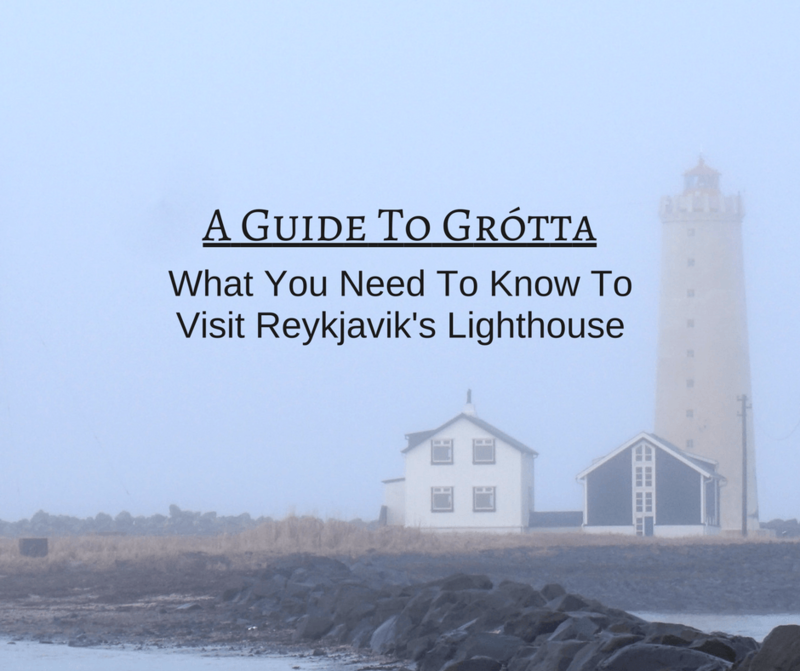 It’s about a 10 minute drive from downtown Reykjavik and there’s a small parking lot in front of the lighthouse. If you don’t have a car, you still have a few options. You can take a taxi, take a bus, walk, or do a combination of the three. To save some time, we took a taxi to get there. We were already downtown, so we walked over to Ingolfstorg Square where there is a taxi stand. The taxi ride cost us 2600 ISK (about $23). Keep in mind, however, that once you’re out there you are in an area that doesn’t have much else around. You will either have to walk back or take a bus. If you want to take a bus to the lighthouse instead of a taxi, look for bus number 11. We suggest bus stop Ráðhúsið near City Hall or the Harpa bus stop, depending on where you are in the city. Take the bus to Lindargotu road (stop Hofgarðar). From there it’s about a five minute walk to the lighthouse. Bus tickets cost 500 ISK (about $4). Note that you have to pay in cash and they do not give change. Pro Tip: If you’re visiting Iceland during the winter, check out this packing list. Between Reykjavik and the lighthouse, there is a really nice paved path that follows the shoreline. We walked about half way back to Reykjavik (about 30 minutes at a leisurely pace) and then took the bus the rest of the way. The bus stops and buses are bright yellow so you can’t miss them. Look for bus number 11 again. From left to right: walking path, bicycle path, road. There are four bus stops along Norðurströnd road, which is the road that follows the shoreline. After those four stops the bus route turns south to get into the city so if you’re planning on walking and taking the bus back to Reykjavik, be on the lookout for those four stops. We had originally planned to walk all the way back into Reykjavik along Norðurströnd road (which turns into Eiðsgrandi road) but we were losing valuable daylight so we decided to catch the bus. We walked over to one of the four stops and saw that a bus was due to pass in 10 minutes. Pro Tip: If you’d like more information on the public transportation in Iceland, you can visit this website that has route planners and timetables. The lighthouse itself is nice, and you can walk out to it during low tide. The area surrounding it is really nice as well, and walking by the rocks, smelling the salt in the air, and hearing the ocean waves was probably my favorite experience of the day. As we walked along the path, we stopped to take a lot of pictures. There were cool rock formations, old anchors, and lots of birds. – If the weather is cooperating, we heard that this is a good place to see the northern lights since it’s outside of the city. – If you’re a birder, keep an eye out for placards along the path that have pictures and descriptions of birds that are common to the area. – Unfortunately, the lighthouse itself isn’t usually open to visitors. – Be mindful of the tides. If you’re out by the lighthouse and the tide starts to come in, you’ll be swimming back! – Note that the islet is closed off during June while birds are nesting. Below is a Google Map that shows where the lighthouse is in relation to downtown Reykjavik. We included the small parking lot (in case you are driving), the closest bus stop to the lighthouse (Hofgarðar), and the four bus stops along Norðurströnd road. Reykjavik has always been a dream destination for me. I don’t know exactly why but it seems attractive and magical. Great post, Vicky! Thanks darling! Maybe you’ll get a chance to go back? Taking the bus is really easy in Reykjavík. You can buy a ticket for 440 ISK with the Strætó bus app. Follow the instructions and just show the screen to the driver and you’re good. The app also shows you bus times and connections that make it super easy to travel the whole Capital Region. A ticket is good for 75 minutes and you can change buses multiple times within that. I’m off to Iceland from Oz in Sept, so looking forward to it and your info is very helpful. I walked to Grotta from my hotel in downtown Reykjavik. It was a nice walk. It was August, so the weather was beautiful and clear. I decided not to walk out to the lighthouse, but I didn’t know which way the tide was going and instead walked along the bay to the south. As I was walking along, I noticed that the Arctic tern were paying more and more attention to me. It is a nesting area, but, according to the signs, it was not nesting season, so I initially didn’t think that was the problem. I figured I would get through that section and they would leave me alone. But they didn’t. It just got worse. First, one started dive-bombing me and then more joined in. It really felt like a scene out of Hitchcock’s “The Birds”. It started to get scary and I wasn’t sure whether to continue on, turn back, or head inland, as there were plenty of birds (or water) on all sides. I turned inland and they got more aggressive, so I turned back to where I had come. As I got clear of where the tern were, one made one last dive-bomb in a seemingly “and stay out” move. That is what I remember about Grotta. Oh wow, that’s crazy!! What a crazy experience. There were some birds around when we went, but definitely nothing crazy like that!